We are ecstatic to be invited to the China Robotics Challenge for the second year. 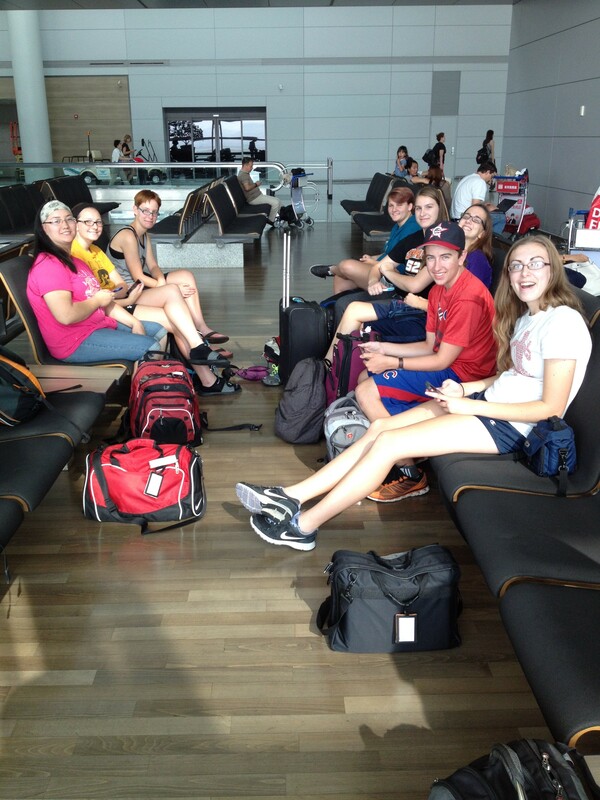 The total travel time to Schenzhen from Cedar Falls was about 24-26 hours, which included 2 flights, a layover in South Korea and a long drive. Our group included 8 students and 8 mentors. During the first few days we worked with other experienced teams to help everyone finished their robots for the scrimmage. Teams traveled from Brazil, Australiam and the US for the second scrimmage in China. It was great to work with teams from all over the world. During the event our mentors volunteered in key roles while working closely with new volunteers to prepare them for future events. China was fantastic and a wonderful experience for the team. Last October we participated in an unofficial off season event call the Cowtown Throwdown in Lee’s Summit Missouri. We were very fortunate to win this event, and we’re proud to take the traveling trophy to Iowa for the first time! Going to an offseason event is a wonderful way for new students to see and feel what an actual regional is like. You can be told what a regional is hundreds of times but actually going to one is a whole other ball game. There is so much energy of seeing other teams and their robots performing at a competition. Later in the fall we learned that Dike-New Hartford high school students were very interested in starting an FRC team. They had a lot of questions, so we drove to their school so our students and mentors could share their experiences of being on an FRC team. We explained what FRC entails, such as fundraising, brainstorming, having a business plan, and told them about the grants that were available to help them get started. Mr. Swartley worked with their lead teacher to get their team registered. We also helped them with a grant application for John Deere. We are looking forward to seeing them at the Iowa Regional. On December 5, we ran our 8th consecutive FIRST LEGO League Regional Qualifier We also held a FIRST LEGO League Jr. Expo for the 4th year. We had a total of 50 teams at the event. In addition to the event, our team gives demonstrations with our newest robots, giving the 6-14 year olds attending the event an opportunity to see the program they can participate in when they reach high school age. This event has grown so much in popularity all openings are filled two minutes after registration opens! 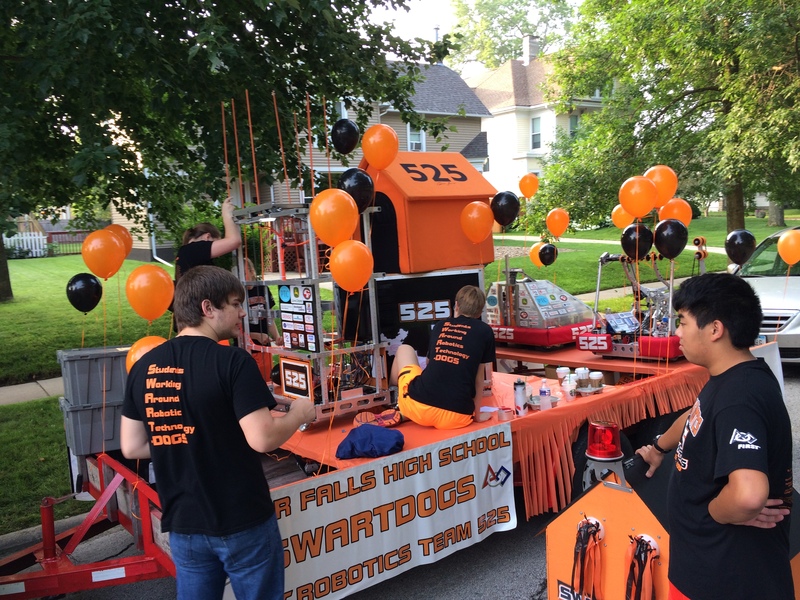 We created a robotics float for in the Sturgis Falls parade, an annual community event, and receive the Willie S. Wonderful award. After the parade we gave robot demonstrations near Overman Park. The parade was very fun. It was especially exciting to see kids’ eyes light up when the parade bot would drive near them. 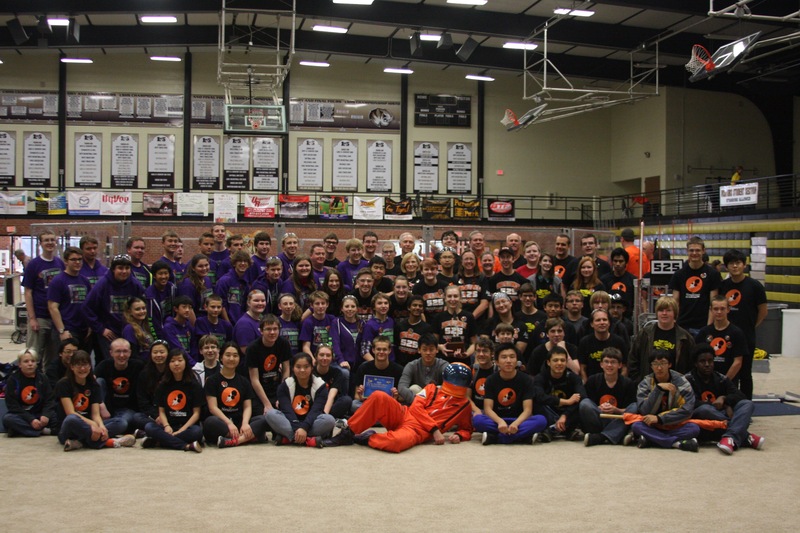 January 9th we hosted an official FRC kickoff. 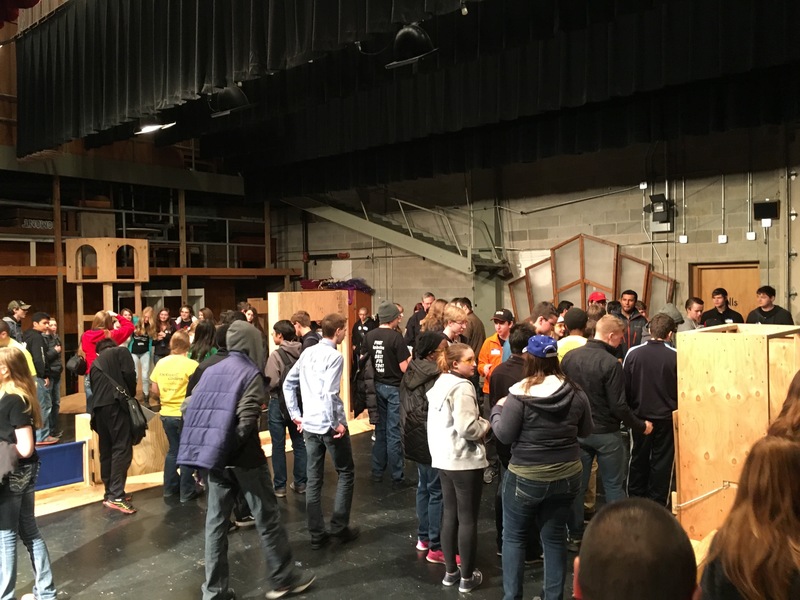 Ten FRC teams gathered at the Cedar Falls High School auditorium to watch the kickoff video. This year’s game looks to be very exciting and should be a lot of fun to watch. The name of the game is Stronghold, and has a medieval theme. Be sure to check out the game video at http://corporate.comcast.com and search FRC 2016 kickoff. Following the game announcement, teams were able to explore the field. Four of our mentors signed non disclosure agreements to secretly build the field during Christmas break. It took approximately 200 hours of work to complete. We are very grateful for the time they put into building the field elements in time for teams to visit our school. We were once again asked to give demonstrations at the FLL State Championship on January 16th at Iowa State University. Our students love the opportunity to talk about all our robot features to enthusiastic FIRST LEGO League teams. After 17 years of dreaming about it, we are working closely with FIRST headquarters in New Hampshire to hold the first FIRST Robotics Competition in Iowa! Five of our mentors have been organizing the event to be held in both the McLeod Center and the UNI Dome. 57 teams are traveling from Nebraska, North Dakota, Minnesota, Illinois, Wisconsin, Missouri, Kansas, Brazil and China for this unbelievably exciting event!! Please mark March 24-26th on your calendar to plan to see what an exciting FIRST Robotics Competition is like. Matches will take place in McLeod and team pit areas in the UNI Dome. If you are interested in volunteering, please contact our volunteer coordinator at IowaFRCVolunteers@cfu.net. If you have questions about the event please contact the event organizers at IowaFRC@cfu.net.